Federal and Connecticut laws require employers to post notices informing employees of their rights and protections while performing work for their employers. 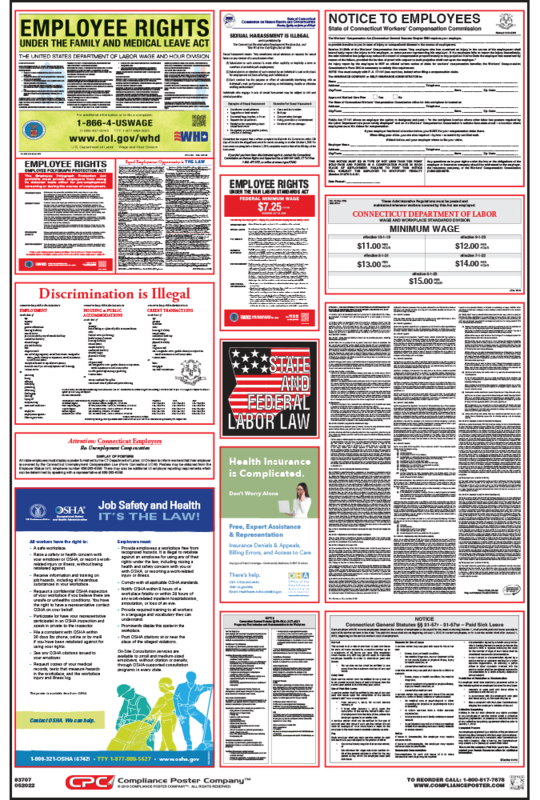 Connecticut Labor Law Posters contain each of the state and federal mandatory labor law notices that must be posted in the workplace. In Connecticut, employers may also be required to post a separate city or county poster depending on their location. Connecticut Discrimination is Illegal posting updated with a new protected class. Workers’ Compensation posting updated with a new section on compensation claims. New Pregnancy Discrimination and Accommodation in the Workplace posting. OSHA: Job Safety and Health It’s the Law! Employers must obtain Form Connecticut UC-8 from the Employer Status Unit and display it conspicuously in the workplace. Connecticut Smoke Free Posters: Smoking and/or vaping are prohibited in certain locations.